Why buy junk at a store when you can waste more money trying to pick it up with a robotic arm inside a glass case? Obviously many Japanese kids prefer the challenge of shopping the hard way because this fad hasn't died out in the 6 or so years I've been here. Arcades might have closed down long ago in Canada and the US, but in Japan they're still alive, (though not kicking too hard). 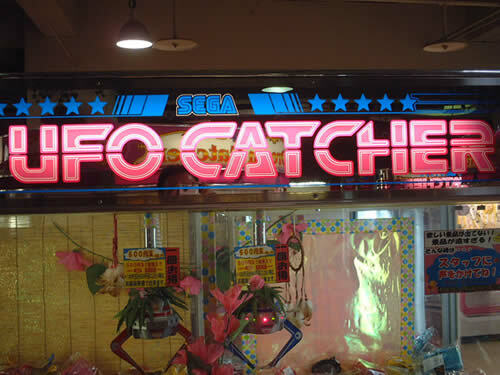 However video games don't take up much space these days, they've made room for other things, notably UFO catchers. 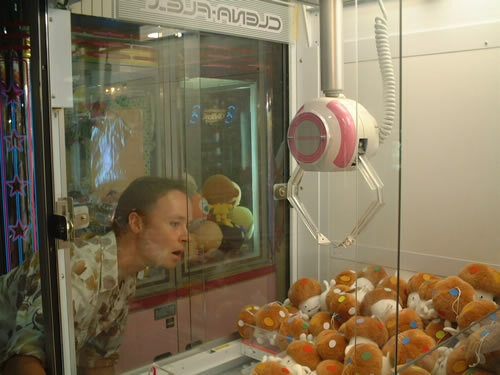 You can hardly walk around the main shopping areas in Tokyo without seeing a couple of arcades crammed full of these things. Mainly they're full of ugly stuffed animals, but you can also find ones with little plastic toys, candy, games, and other useless junk. 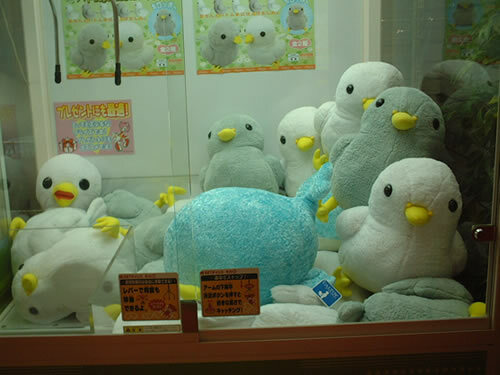 Occasionally you might come across something nice, and if you're a guy with your girl, she'll usually be pleased when you give her the stuffed toy you've won. Ok so it looks easy right? 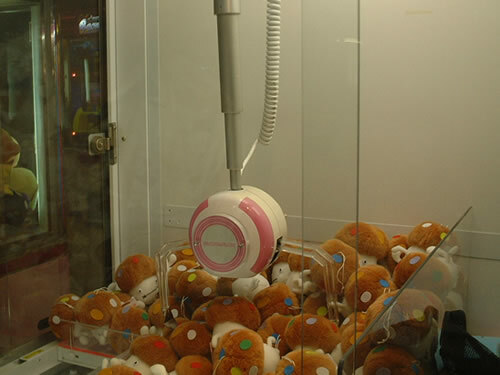 You position the metal arms where you want, they come down, grab the prize and drop it down the chute for you. Wrong. For one things the little arms that are supposed to grab things have the equivalent strength of your little toe, which is to say that they'd have trouble picking up an empty plastic bag. The best you can do is to kind of nudge a toy that happens to be sitting near the edge, and hope it falls down. Here I am about to try my luck. 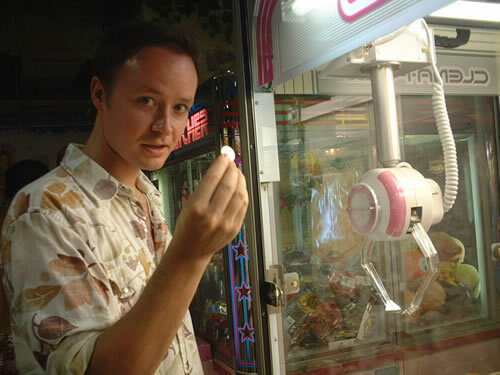 One go costs 100 yen (about a buck) so no fooling around here! Found a bunch of stuffed mushrooms, the logo of Docomo (phone company). Kumi thought they were cute so.... First step is to position the arms where you want em, so far so good! The arms scrabble uselessly through the rubble. Did they snag something? Fast forward in time a bit and here I am again ready for another try! Kumi and I found a case that we both liked that was full of what looked to me like big chickens. 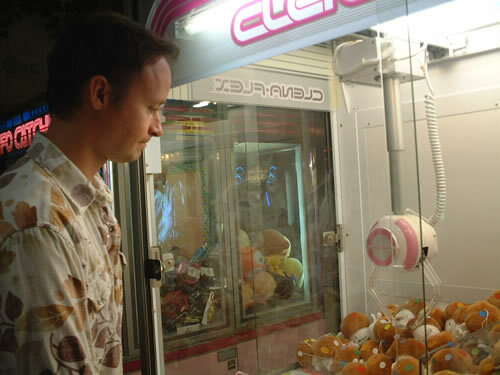 Sometimes you can find large sized toys but this means you have to pay more to play. In the case of the chickens, one try was 200 yen or 3 tries for 500 yen. I wisely decided to pay only 200 yen, I was feeling optimistic! However none of the chickens were in a good nudging position as you can see. Kumi then told me you can ask the staff to arrange one of the toys so it's easier to grab. I was sceptical but she asked and lo and behold, he moved it! Hmmm, not sure why I wasn't told this the first time with the mushrooms though.... Anyway it seems kind of silly of them to move it for you, but hey! If you want to make it easier for me who am I to complain? Success! I managed to get a chicken on the first try. I think the guy that moved it for me felt a bit dumb, but it's my chicken now! So why aren't there any pictures of the action? Well Kumi got so excited watching that she forgot to take any. She tried to snap some after, but the same guy told us we weren't allowed to take pictures. No pictures? I natually asked why. He said to prevent people from copying the stuffed animals and making them at home. Excuse me, but now that I've got this chicken what's to stop me from taking a million pictures of it or making replicas and selling them on Ebay for 10$ each? Anyway of course I'm not going to keep it, dunno what I'd do with a stuffed chicken. 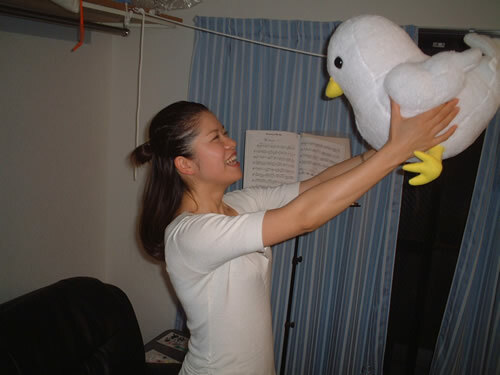 Kumi was happy to take him though, here she is expressing her joy, no doubt he'll make an excellent pillow!